Bunyip is located on the Gippsland railway line, 77 km east of Melbourne. The rich farmland of the former Koo Wee Rup Swamp stretches to the south. The name Bunyip, or Buneep, originates from a creature of Aboriginal myths supposed to inhabit the swampland. The name was used for the area as early as 1847 when a route was surveyed from Dandenong into Gippsland. The Buneep Buneep run, taken up in 1851, was bordered by the Bunyip and Tarago Rivers. A township, known as Buneep, was surveyed beside the Bunyip River. An improved route to Buneep was surveyed in 1859. This became known as Old Telegraph Road, as the telegraph line from Melbourne to Sale was installed along it. The 'Old Buneep Hotel' was built to take advantage of the new coach service. However, by the 1860s another track, Old Sale Road, was opened further south. New Bunyip was situated where the Princes Freeway now crosses the Bunyip River. The New Bunyip Hotel was built here in 1867. A settlement was planned but before there was any significant development, the railway line to Gippsland was constructed 2.5 km south of New Bunyip. The railway reached the Bunyip River in 1877, terminating here until a bridge was built over the river. The Koo Wee Rup swamp was formed by the Bunyip River and a number of large streams. The country was impenetrable, covered in tall swamp grass and ti tree scrub. Plans for its drainage had been discussed since the early 1880s. In 1889 a contract was let for works at the seaward end and in 1891 drainage works began south of Bunyip. Workers and materials were brought in by rail and many properties were selected in and around the town. 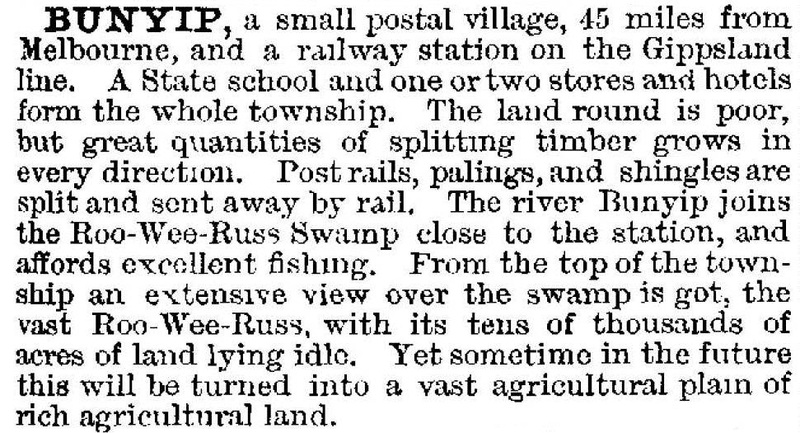 During the depression of the 1890s a village, first known as Bunyip South, was set up on the swamp. The settlers worked on the drains and farmed their blocks as the land dried out. The muddy condition of roads led to the formation of the Bunyip Junction Tramway Company about 1893. On this wooden tramway goods were sent out from Bunyip. A small settlement developed with a store, post office, hall, churches and later a creamery and butter factory. The government had gazetted the name Bunyip South but in 1901 the settlers conducted a ballot for an alternative name. They chose Iona, after an island of the west coast of Scotland. There were a large number of Irish among the settlers, resulting in the construction of St Joseph's Catholic Church in 1900. A presbytery, hall and school were also established in the following years and a substantial new church constructed in 1940. A state school, first known as Kooweerup North, was opened in 1894. It has been closed and removed to nearby Nar Nar Goon. Floods in 1893 showed the first drains to be inadequate. Despite deepening, severe floods in 1900 and 1934 devastated the former swamp. By 1900 large acreages of potatoes were being grown, with carrots, onions and garlic also important crops. Timber was an important product of the Bunyip district from the late 1880s. A sawmill on Cannibal Creek, north-west of the town, used a tramway to transport its timber to the railway. Thousands of tons of palings were railed from Bunyip, as well as sawn timber, shingles, posts and firewood. A number of sawmills operated in the dense forest north of the Princes Highway as late as the 1940s. In the early 1890s a village settlement was attempted in the area. However, Tonimbuk, an Aboriginal work meaning scorch or burn, was soon virtually abandoned. The few settlers who stayed were employed in sawmills while clearing their land. Production of eucalyptus oil was a common sideline. Orchards were planted when the land was cleared. These flourished until the 1940s when dairying and grazing began to take over. By the 1970s, there were only a few orchards left in the area. The life of the small community was centred round the school (1900-47) and the hall. Cattle grazing and horse breeding are now popular pursuits in this attractive rural district. A number of public buildings were constructed, including the mechanic’s institute hall (1906) and the Railway Hotel (1924). By 1938 the Victorian municipal directory described a substantial town with a post, telegraph and money order office, a court house, public hall, State school, three churches, two hotels, a newspaper and four stores. There were a racecourse, a recreation reserve and an annual agricultural show. Land to the north of the town was made available for selection by orchardists and farmers from about 1910. The cool store was opened in 1926 and was the centre of fruit growing activities for the whole district. Bunyip's growth has been slow and steady. It is the largest of the several towns along this stretch of the railway and therefore supports some higher level services. The hospital, opened in 1966, has been converted to an aged care centre, and there is a community health centre. The shopping centre has changed little over the years, retaining its country atmosphere. The agricultural show, first held in 1900, still runs successfully every year. A country music festival is held each February. Many residents travel elsewhere to work, assisted by Bunyip's location on the rail line. Although still the centre for a farming district, Bunyip has become predominantly a residential town for hobby farms or a quiet country town lifestyle. A Catholic primary school opened on the town’s edge in 2001. Bunyip primary school had 259 pupils in 2014.